Teena in Toronto: Our new stove! When I bought our condo in 2001, I was the second owner. I bought it from an older couple who hadn't made any upgrades (they bought it new and moved in in 1999). I'd wished they'd upgraded the bathtub and the stove. 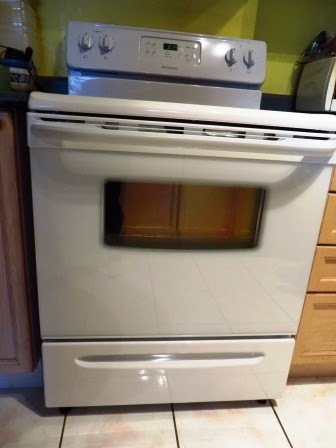 It was a pain to clean the oven but we couldn't justify replacing it ... until recently. A couple weeks ago I turned the oven on to cook chicken for supper and noticed that nothing was really happening. We changed the fuse to no avail. I'm sure we could have gotten someone in to repair it (the burners still worked) but we took it as a sign that it was time for a new one. We didn't want or need anything fancy or expensive ... we just wanted it to self-clean and not have coil burners (our old one did). We ordered one last week and it just arrived. Whoohoo! Look how pretty and shiny it is! Ha! 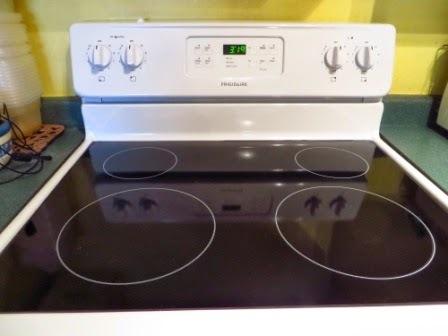 For an extra $25, the delivery guys took our old stove away. If it can be fixed, the Brick will donate it to Habitat for Humanity. If not, they'll junk it. That is really nice! You must be so excited. Don't you just love the sealed burners so much? I don't know what I did without them. I would have paid the $25 removal fee too just to be done with the hassle!